Don’t let your kitchen remodel damage your plumbing! When you’re ready to remodel your kitchen, don’t forget about the various utilities that you depend on when you’re in there. One of the most important is the plumbing, but there are others, too. Let’s have a better look at each of these in turn. First of all, the plumbing lines in your kitchen are the most important. During your kitchen remodel, the plumbing might be damaged, so what should you do? The sink needs to be able to dispense both hot and cold water. You’ll also need plumbing lines to the dishwasher, because you don’t want to have to wash five or six piles of dishes at a time by hand. Now then, let’s not forget how important the electrical supply to your kitchen, and the rest of your home, is. Your kitchen outlets need to be functional, and so do all the devices and appliances that rely on that electricity. So, during your kitchen remodel, keep that in mind. 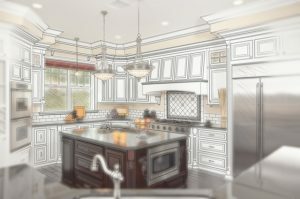 Don’t forget about where you’re going to position the lights in your redesigned kitchen. One overhead light might not be enough – you might need task lighting over the sink and the stove, too. Then again, you might also have gas powering part of your kitchen, remodeled or not. Watch out for where the wires are, because you might need the assistance of an electrician. So what if you have gas running through your home, too? Let’s discuss that next. You might have to adjust where the gas lines are going. Your gas-powered stove is powerful and you might prefer that for cooking purposes, but you need to be careful too. You don’t want the pipes going the wrong way and causing a problem when it’s time to remodel your kitchen. Whatever you need, don’t hesitate to call Master Plumbing. This entry was posted on Friday, April 6th, 2018 at 3:46 am. Both comments and pings are currently closed.